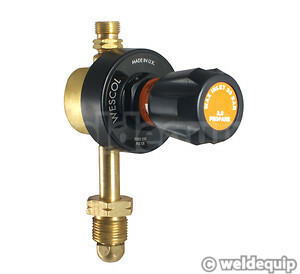 Industry standard Propane regulator used for all heating & cutting applications. Solid brass construction, ‘plugged’ – pressure gauges are not normally fitted to these regulators as a contents pressure gauge will never show an accurate reading with liquid Propane – with output pressure set by calibrations marked under the pressure adjustment knob. Standard 5/8”BSP left hand gas cylinder connection with 3/8”BSP left hand hose connection.